Florida’s highest-achieving eleventh-grade science, technology, engineering and mathematics (STEM) students will join their peers from around the state at the 2015 Sunshine State Scholars program on Thursday and Friday in Orlando. The two-day awards and recruitment event celebrates the accomplishments of these elite students and provides a unique venue for Florida’s colleges and universities to recruit their talents. Local school districts, Florida Virtual School, Florida School for the Deaf and the Blind, and Florida’s developmental research schools choose their top eleventh-grade STEM scholar to participate in the conference. The Sunshine State Scholars program is made possible by a partnership between the Florida Education Foundation, the Division of Florida Colleges, the State University System of Florida and the Florida Department of Education. For more information about the event, visit Sunshine State Scholars or follow the event activities live on Twitter using the hashtag #FLSTEMScholars. For more than 30 years, I have worked with and on behalf of Florida students and I can honestly say this is the best time for education I have experienced. Florida has been recognized as a national leader for student achievement and teacher preparation and, to build on these successes, Governor Rick Scott has proposed historic funding for K-12 education, as well as policies that will help Florida students earn a college diploma faster and with less debt. Our graduation rates are at an 11-year high, we’re ranked 7th in the nation for K-12 academic achievement and we have been successful at narrowing the achievement gap between African American and white students. I credit the hardworking teachers and school staff members who come in early, leave late and spend the extra one-on-one time with students so that they are prepared for success in the classroom and in life. I had the honor of joining Governor Scott at Atlantic Technical College in Broward County where he announced his proposal to increase per-pupil funding in the 2105-16 fiscal year, and the response was overwhelmingly positive. Governor Scott is truly a champion for education; we already had the highest total spending for our state’s education system last year and he is the first governor to have a specific appropriation dedicated to teacher pay raises. Last year, Florida invested a total of $18.9 billion in K-12 education, which was the highest to that point. Now, the Governor is proposing an increase for a new record total of $19.75 billion to ensure Florida’s students have access to a world-class education. This amounts to a $261 per-student increase over this school year and a $50 increase from the previous record. I credit Governor Scott’s commitment to job creation and overall economic growth for enabling us to have the additional funds to invest in education. I am confident that this investment will pay off for years to come as graduating students will be able to contribute to Florida’s economy once they enter the workforce. Florida students are fortunate to have many of the nation’s best principals and teachers, and this new proposed funding will ensure they have the necessary resources to continue thriving. To learn more and hear what stakeholders have to say, click here. During last month’s State Board of Education meeting, I had the pleasure to recognize Citrus County Superintendent Sandra Himmel as the 2014 Lavan Dukes District Data Leader of the Year. Past winners of this unique award often come from large urban school districts. However, as Superintendent Himmel proved, using valuable data to guide decision-making is vital for school systems of all shapes and sizes. 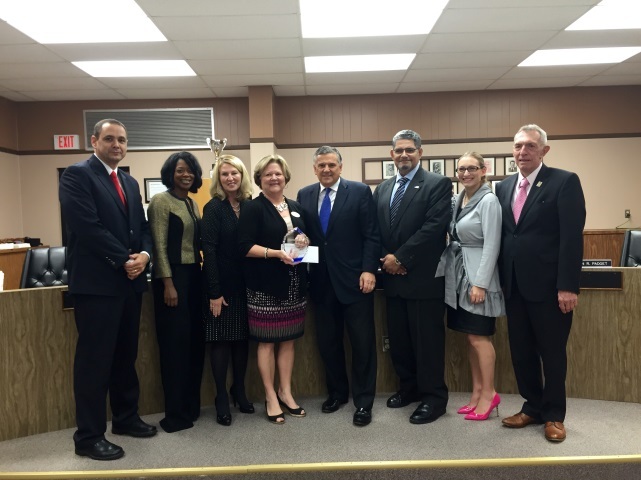 Commissioner Stewart and Florida’s State Board of Education presented Citrus County Superintendent Sandra Himmel with the 2014 Lavan Dukes District Data Leader of the Year award. Gathering quality data on student proficiency and performance is vital to understanding what is working in our classrooms and where we have room for improvement. What makes Superintendent Himmel stand out among the other accomplished finalists is her tenacity to examine data trends, use the results to drive new initiatives and share the outcomes with teachers, parents and leaders in the Citrus County community. In her recent “State of the District” presentation, Superintendent Himmel mapped out reading and mathematics proficiency levels for each school, comparing the district average to previous years and to statewide proficiency levels. Within one click from the main Citrus County School District website, parents and educators can see the tremendous progress students have made in key subject areas, and which schools are exhibiting the greatest growth in student achievement. District staff also tracks the percentage of students taking advanced coursework and national assessments, comparing Citrus County students to both state and national score averages. 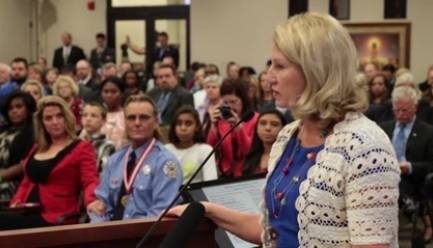 “We always ask this question ‘how does it impact our students,’” she told State Board of Education members on Tuesday. From looking at 2013-14 school year data, Superintendent Himmel can assure her district’s dedicated educators that their efforts have resulted in higher student performance across the board. I congratulate Superintendent Himmel and her staff for leading the Sunshine State in using inventive and appropriate data to cultivate higher achievement for all students.